Come home to the comfort and warmth of Pacific Energy Gas Stoves | Pacific Energy Stoves, the perfect gas stoves for heat and ambiance. 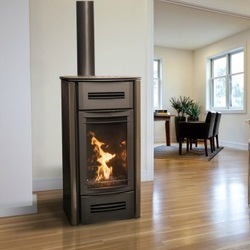 These stoves are the ideal solution for new construction, remodels or conversion of an existing masonry fireplace. For ultimate heat efficiency and heat, each stove uses large aluminum heat exchangers. Plus each stove comes with a one-touch remote control. This remote lets you easily control heat for extra energy savings. 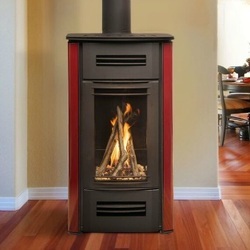 Enjoy the attractive, large fire even when the stove is on the lowest setting. Please browse the gas stove gallery below and please contact Bare's Stove and Spa for any assistance. 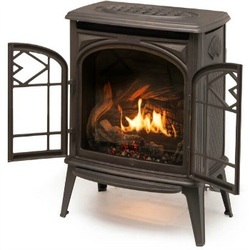 The Trenton cast iron freestanding gas stove blends conventional design with state of the art gas technology. Enjoy the fire ambiance. Ornate doors swing wide to unveil a beautiful fire display. Crafted to heat small to medium areas the Trenton Classic is offered in two porcelain enamel finishes. Select the enamel finish that best suits your tastes and style. 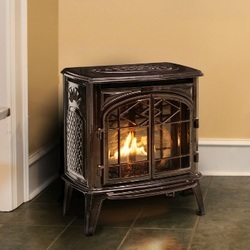 This stove is the epitome of timeless cast iron elegance. ​The Mirage 18 is engineered to deliver strong, high efficiency heat for your home. A one touch remote simplifies operation and controls the heat and fire appearance. Choose from a variety of colors to customize the look of your unit. ​The Mirage 30 is on the cutting edge of large gas stove design. Perfect for heating large areas this unit is available in a variety of porcelain enamel finishes. Pair your home's style to an enamel finish option.